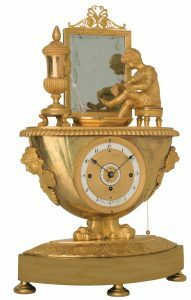 Back to category Empire and Biedermeier Clocks. Illustration of a courtly child in the bath with a samovar (the flowing water is represented symbolically by a twisted glass rod), a standing mirror, a lavoir and a stool on which the child sits in a nightgown and washes with a sponge and washcloth. On the side of the clock case are two psyche reliefs. The clock with the special, very intimate, scenic representation is executed in the finest fire-gilding (ormulu) and engine turning. It is thus a most exquisite piece of work made by the metalworkers and gilders.